Portuguese Podengo is a very old dog breed with a known history dating as far back as the 12th century. The Portuguese Podengo was used as a hunting dog throughout most of the breeds history, both to rid farms and homes of vermin and to put food on the table. The Portuguese Podengo is found in three sizes. 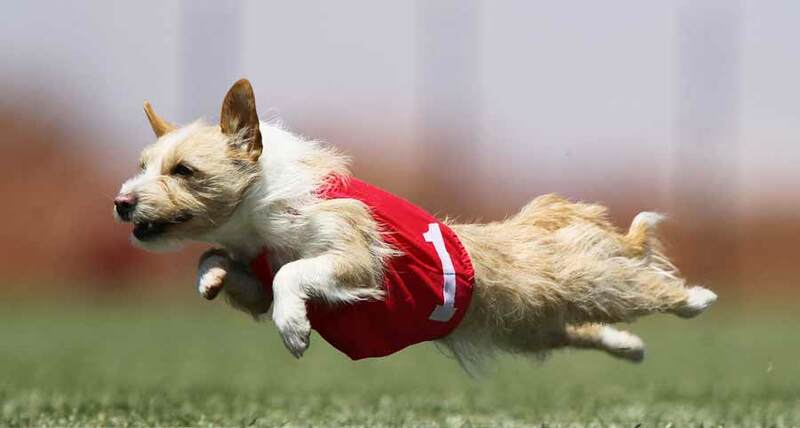 The Pequeno is the smallest Portuguese Podengo, at 8 to 12 inches tall and 9 to 13 pounds. This dog is solid, small, and short-legged so that she can enter burrows and rabbit warrens. The Medio is in the medium Portuguese Podengo, at 15 to 22 inches and 35 to 44 pounds. The Medio is longer-legged than the Pequeno. The Grande is the largest variety of Portuguese Podengo and is very rare. All three sizes have upright prick ears, a tapered muzzle in balance with the head, expressive eyes, and a high, curved tail. There are two coat types: a smooth coat Portuguese Podengo and a terrierlike wire coat Portuguese Podengo. The coat colors vary but include fawn, red, and white, with or without patches of color. The grooming needs of the Portuguese Podengo dog breed vary. Both coat types need at least twice weekly brushing. The wire coat has a beard, which may need cleaning to remove dirt and food particles. Many Portuguese Podengo owners trim the wire coat to keep the dog neat and clean. All three sizes of the Portuguese Podengo dog breed were used as hunting dogs and retain those hunting instincts. Their daily exercise should always be on leash or within a fenced-in area, because if a rabbit or squirrel is flushed, these dogs will chase it. Because the Portuguese Podengo is a very good watchdog, early socialization is important so that she can become comfortable with people outside of her family. Early training is also needed; this is a bright breed who is very curious. Training can channel her mind in productive ways. The Portuguese Podengo breed enjoys agility and flyball training. This adaptable breed can live in the city or suburbs but does need an active owner who will do things with her. She is great with children who treat her well but is not always good with small pets. Portuguese Podengo is a healthy breed. Share your Portuguese Podengo story. Note: Upload only Portuguese Podengo picture or your picture with Portuguese Podengo below - spammer's ip may be blocked.